ePublishing Knowledge BaseePublishing Knowledge BaseePublishing Knowledge Base EditorialHow do I associate PDFs, photos, video and other media with articles or blog posts? This article shows you how to associate media files with your article or blog post. The media will not appear within the content itself but rather below or next to the content, depending on the website's design. 1. 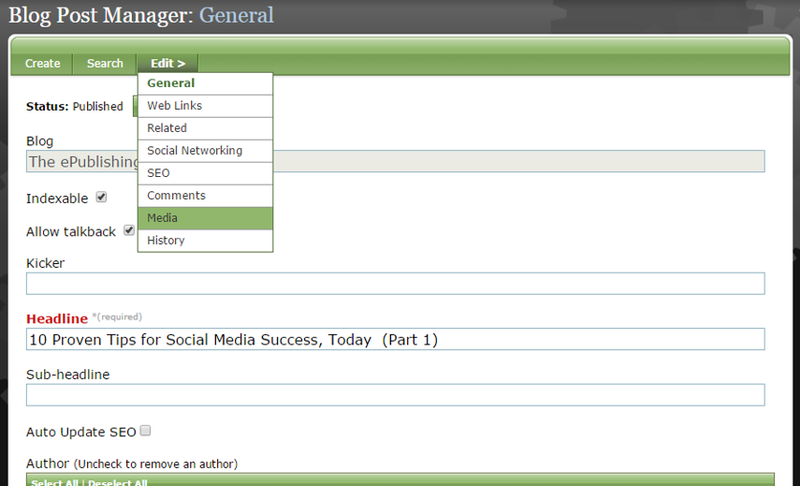 Under Edit in the Article or Blog Post Manager select Media. 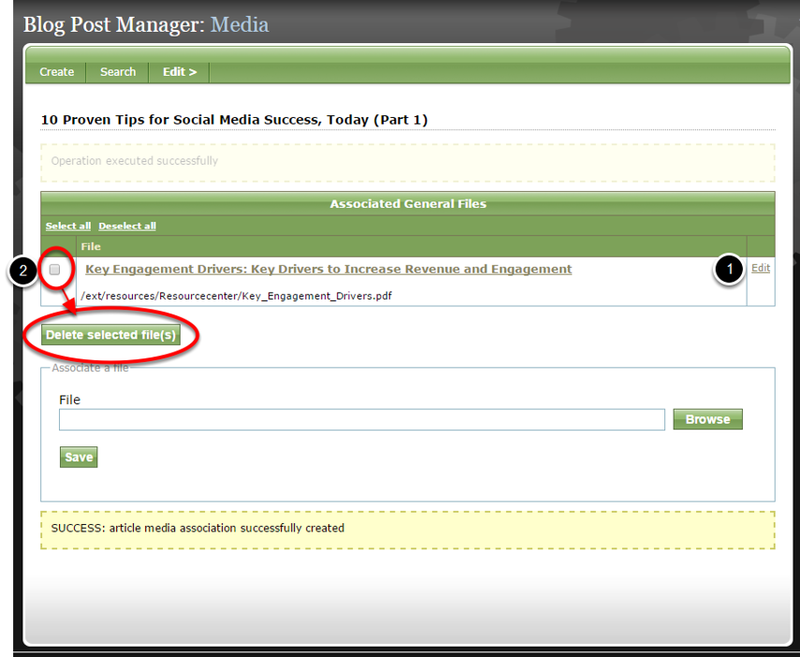 Zoom: Under Edit in the Article or Blog Post Manager select Media. 2. 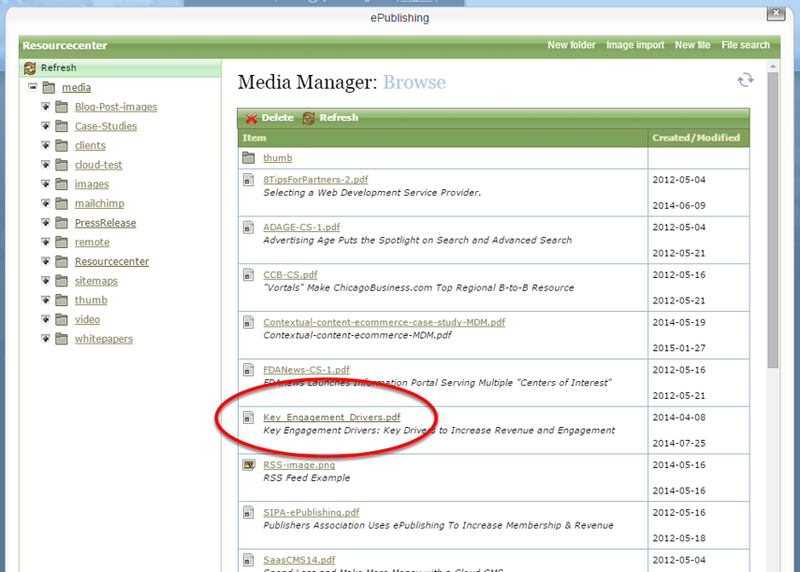 To associate a file with your content, select Browse to access the Media Manager. Zoom: To associate a file with your content, select Browse to access the Media Manager. If you already know the path of the file you'd like to associate with the content, you may also paste it in and click Save. 3. 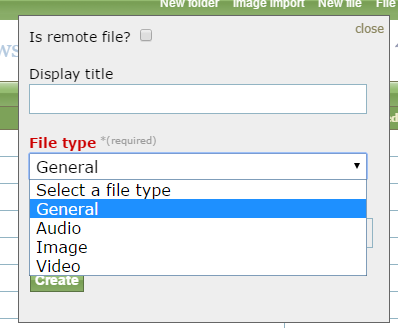 In the Media Manager, select your file. Zoom: In the Media Manager, select your file. 4. If you need to upload a new file, click New File in the top right of the window. 4.1. Select the correct file type. For PDF files, select General. 5. After selecting or uploading a file, you will be taken to the file's properties. Scroll down and click Select to associate it with your content. Zoom: After selecting or uploading a file, you will be taken to the file's properties. Scroll down and click Select to associate it with your content. 6. 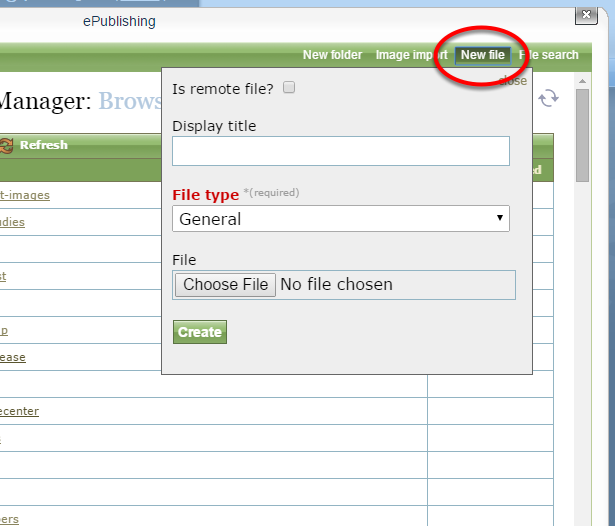 The file path should now appear on the Media page of the Article or Blog Post Manager. Zoom: The file path should now appear on the Media page of the Article or Blog Post Manager. 7. Click Save. When the file has associated successfully, you will see a yellow box at the top and bottom. Zoom: Click Save. When the file has associated successfully, you will see a yellow box at the top and bottom. To edit or replace a file already associated with the article or blog post, click Edit. 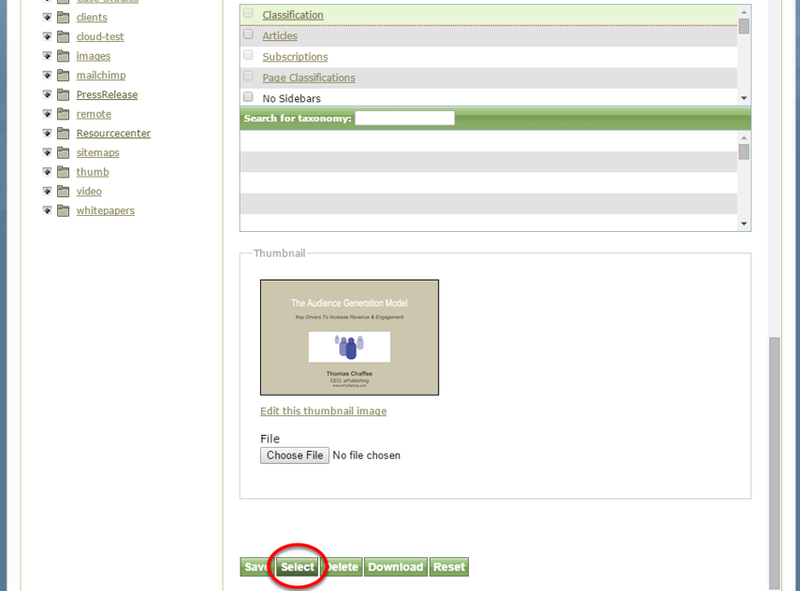 To delete a file associated with the article or blog post, select the box next to the file and click the green Delete selected files button. Prev: How do I assign site placement for articles? Next: How do I manage comments?